That was the worst drive home I can remember. It took one whole hour to do the first mile. 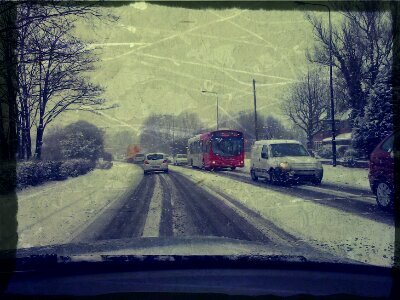 There was almost grid-lock in all the built up areas because of this snow. I could see gritting lorries but the road was coated in a lumpy layer of glassy compressed snow. In all the Journey took 2 1/2 hours. Just for security, I pulled over to get extra petrol on a stretch of road where the car was doing 9 mpg. This land does look lovely though. This entry was posted in Travel, Weather, Work and tagged drive, grid-lock, Snow, winter. Bookmark the permalink.